You can now swap the positions of two items in the inventory if they are of the same size. 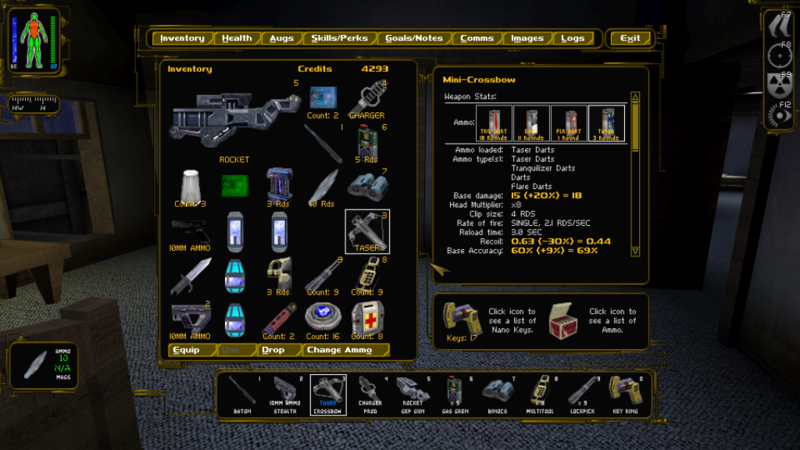 This adds depth to inventory arrangement without eliminating the “Tetris” element. Inventory Mouse shortcuts: Right click to use items, or to equip/holster weapons. Middle mouse button to drop items. Real Time UI option: if enabled, this option makes the inventory/UI real time, meaning time is not paused when in the inventory etc. This adds both realism and game difficulty, and is not recommended for newcomers. New sounds for use of inventory items. New weapon statistics displayed: noise level, headshot multiplier, firing type, lethality and more. 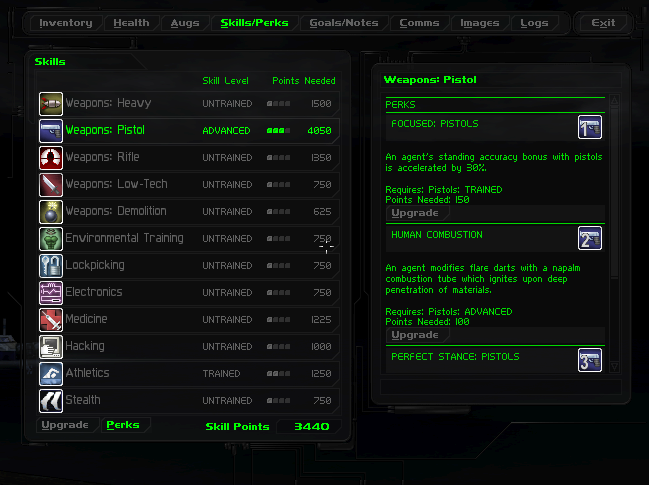 New weapon modification information screen that shows all currently installed weapon modifications. correct values displayed for a number of stats. Ammo information now displays maximum ammo carry capacity. Pressing the HEAL ALL button distributes one medkit at a time as opposed to all needed to restore you to full health, thus making use of it a more tactical affair. Pressing the newly-added STATUS button will display a variety of statistics that the computer built into your head can realistically track, and sensibly should track. Convenient mouse toggle shortcut: right click on a selected augmentation to activate/deactivate it. New visual effects for highlighted augmentations. 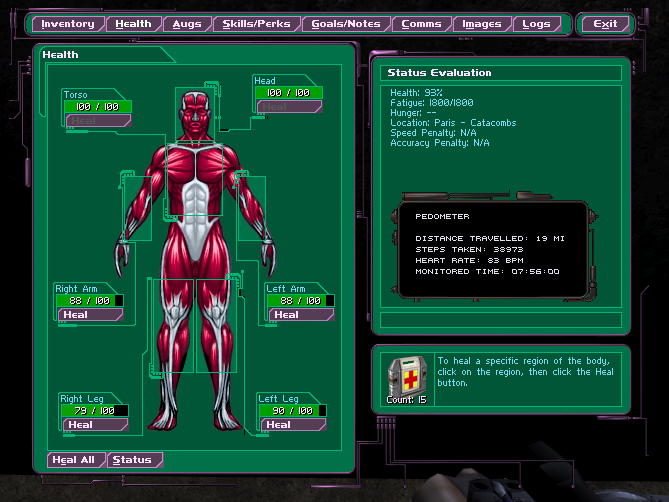 New augmentation stats accessible by pressing the new STATUS button. A wealth of new information that details exactly what each augmentation does. New Perk window. Click the “Perks” button to access. A wealth of new descriptive information, such as how many points are needed for master level investment. Beware the new stealth skill also. Text size for readable objects such as books and datacubes is scaled up to be readable at higher screen resolutions. The same is true for most HUD elements, such as ammo counter. Alternate ammunition is color-coded in the Toolbelt, so you always know what ammo type you have loaded (can be turned off via options screen). If you have upgraded your EUAS augmentation the brightness/darkness of the environment will be displayed, aiding with stealth. Ammo pickup counts are displayed when looting corpses. Doors and Hackable Devices now display their damage threshold. Skill rewards occassionally notify you how many skill points you have in total. When holstering a weapon, said item stays highlighted in the Toolbelt. When you use the mouse wheel (next weapon/previous weapon) the highlighted weapon is equipped again. This is difficult to describe, but it is extremely useful. You can also make your own custom color themes for both the HUD/UI and menus in GMDX.